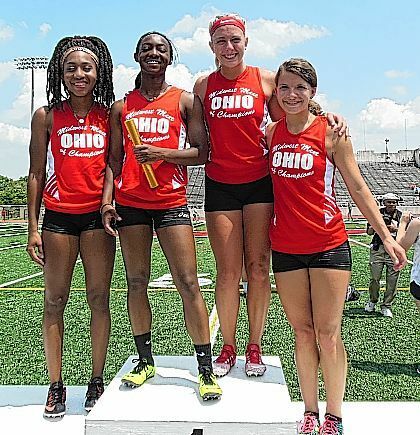 Galion’s Michaela Slone (far right) was a member of the Team Ohio 4×100-meter relay squad that won the event at the 2015 Midwest Meet of Champions last Saturday at Ohio Wesleyan University in Delaware. Other team members were Allison Mayfield-Brown, Jenea Adams and Carmen D’Ippolito. Team Ohio won both the women’s and men’s overall team championships. DELAWARE — Team Ohio claimed both the women’s and men’s team trophies at the 2015 Midwest Meet of Champions held last Saturday at Ohio Wesleyan University in Delaware. The event featured some of the top senior track and field athletes from Ohio, Michigan and Indiana. The Team Ohio women’s squad outscored Michigan 193-164 to earn the team trophy. Indiana placed third with 87 points. In the men’s meet, Team Ohio tallied 224 points, while Michigan finished with 130 and Indiana scored 119. Michaela Slone from Galion High School competed for Team Ohio in both the 4×100-meter relay and 100-meter dash. She teamed with Allison Mayfield-Brown, Carmen D’Ippolito and Jenea Adams to win the 4×100 relay. They posted a time of 47.43 seconds. Michigan placed second with a time of 48.11 seconds. Indiana finished third with a time of 48.32 seconds. Slone along with Mayfield-Brown, from Meadowdale High School, and Adams, from Cle. St. Joseph Academy, were all 2015 OHSAA state meet qualifiers. D’Ippolito, from Grove City High School, was a regional qualifier this season. Slone placed seventh in the 100-meter dash, posting a time of 12.75 seconds. Team Ohio’s Simone Green from Akron Buchtel won the race with a time of 12.24 seconds.